The past Olympics has been the best hockey I've seen in recent memory. I rank it up there with the 87 Canada Cup, 2005 World Juniors and the 2002 Olympics. There is something about tournaments when you have one shot to win the game and you better bring your A game ( the Russians thought it was a best of seven). Before the games, I didn't bother to predict who would win, because it’s a crap shot as 6 teams could pull off winning the gold. Having a hot goalie or lines firing on all cylinders more than likely won the gold. Canada was loaded from top to bottom and had the deepest team. The pressure was on them as they would be playing in front of their countrymen. During the last games in Torino, Canada was a huge disappointment. They expected to bring home the gold, but it never happened as the team struggled throughout the tournament. The lowest point was the shocking loss to the Swiss as they got shut out. The Swiss team was mostly comprised of ex pros who never panned out in the NHL. It was a huge upset that sent the country reeling. After that defeat, the Canadians were stunned and they barely put up a fight against the Russians. The end result was they came home without a medal. During those games, Sidney Crosby was left off the team. It's one of those annoying things that Hockey Canada does - veterans need apply only. As Sidney sat at home, another young superstar in Russian Alex Ovechkin skate circles around the Canadians. The Canadian brass got the message loud and clear - Sid must be on the team. The next opponent were the Americans and they had a much younger team. Many picked them as the fourth best team and the potential dark horse. Much to my chagrin, the Canadians got out played and probably took them lightly. Since it was still early in the tournament, Canada took the loss with a pinch of salt. It wasn’t the end of the world and people forget that at the Salt Lake games, Canada lost to the Swedes, barely beat the Germans and tied the Czechs. Gretzky gave the famous "us against the world" speech and the team responded by winning the remaining games and the gold. The next game the Canadians destroyed the Germans and pummeled the Russians - so much for panic. The Slovaks made it an interesting game and Canada moved in the gold medal and it was revenge. I felt fairly confident that Canada would win because it was on our home turf. 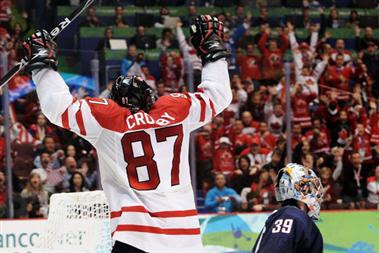 The Canadians scored first and then the Americans tied it and the game went back and forth. The crowd at the rink was going crazy as we were 25 seconds away from winning the gold when Zach Parise the son of a Canadian NHLer tied the game. You could drop a pin as the crowd was stunned. It was sudden death overtime, four on four. The entire country was on edge as nobody moved from the couch or bar stool. After 12 minutes, it was all over as Sid fired the puck through the 5 hole and placed himself in Canadian hockey lore. He’ll never have to pay for meal in Canada for the rest of his life and I wouldn’t be surprised if they put his face on the $20.00 bill.